Versatile Multipurpose SEM The EVO®40 is equipped with accurate and repeatable fully motorised stage, full range of vacuum modes, and objective lens with BeamSleeve™ technology. The class leading X-ray geometry provides users with the most accurate analyses in high vacuum. Essential Specification: resolution 3.0 nm @ 30 kV (SE and W); acceleration Voltage0.2 to 30 kV. 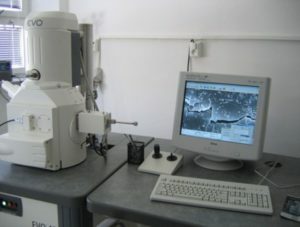 The scanning electron microscope is used for detail chemical and microstructural analysis of ceramic composites, identification of secondary phases distribution in composites, identification and characterization of corroded surfaces and corrosion products of glass and ceramic materials, analysis of inhomogeneities in glass, characterization of crystallization products at study of glass crystallization mechanism. Image resolution by acceleration voltage 15kV min. 1-2 nm, by 1 kV min. 2-4 nm. 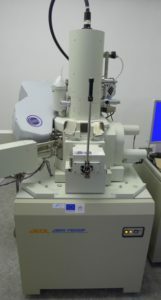 SEM is equipped with analytical modules 1xWDS detector, 1xSDD detector, 1xEBSD detector, including database software for evaluation of EBSD spectra. High-temperature cell Anton Paar with maximum working temperature up to 1600 °C and automatic height compensation and possible measuring in vacuum or in atmospheric conditions. Cryogenic and humidity cell Anton Paar with working temperature ranging 180-400 °C, automatic height compensation and possible regulation of relative humidity ranging 0 up to 95 %. 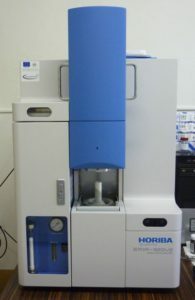 High performance analyzers equipped with unique and sophisticated functions that support accurate and fast carbon and sulfur analysis. EMIA C/S analyzer is an analyzer with outstanding accuracy of less than 0.3 ppm. 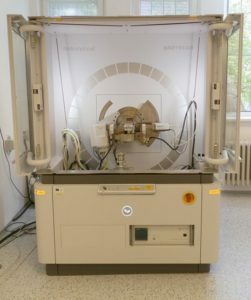 Elemental analyzer dedicated for simultaneous determination of elements oxygen, nitrogen and hydrogen. 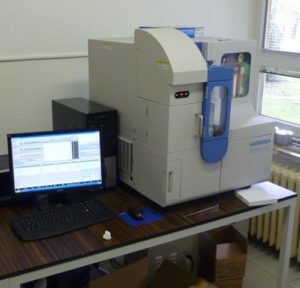 An abundance of analytical functions and excellent, stable control techniques provide fast, reproducible and high precision analysis of materials ranging from micro-quantity samples to high-concentration samples.